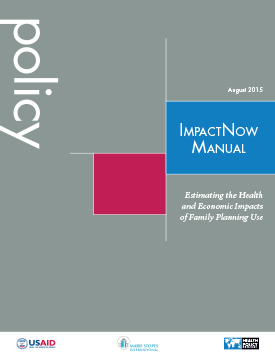 ImpactNow is an Excel-based model that estimates the health and economic impacts of family planning in the near term. It is designed to model the impacts of different policy scenarios and to compare the results of those scenarios in advocacy materials. It is designed to estimate the impacts of many "what if" questions about policy options in the two- to seven-year time horizon; for example, it could be used to estimate the impacts of meeting Family Planning 2020 (FP2020) commitments. The outcomes are focused on reproductive health metrics, as well as economic metrics, such as cost-benefit ratios and incremental cost-effectiveness ratios. ImpactNow was adapted from Marie Stopes International's Impact 2 in collaboration with the Health Policy Project, with support from USAID. The USAID-funded Health Policy Project authored the users’ manual to help health analysts apply the ImpactNow model to estimate the health and economic impacts of family planning programs at national and subnational levels.